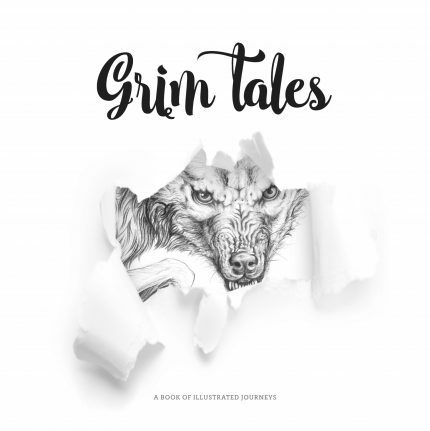 Grim Tales is the product of a collaboration between Tauranga Women’s Refuge, The Incubator and the wider arts community. Using a combination of art, literature and photography as the language to tell a story this collection aims to raise awareness and create connections. It is also designed to empower the participants – the women and children who have related their real life experiences of domestic abuse to the authors and artists. The authors have then rendered the stories as ‘fairy tales’, with beautiful photographs serving to anchor each storyteller to their page. These photographs have then been tattooed over by the artists to form exquisite, gritty illustrations. In the pages of this book can be found the resultant mixtures of malice and beauty, of fantasy and reality. The grim parts are truly that; the abuse is terrible, the entrapment real. But the triumphs and splendour are also genuine. The storytellers have spoken from a position of strength – a strength that they have been given by friends and family, by organisations such as the Women’s Refuge, or that they have found within themselves. Their tales educate us by example, and education is one of the keys if we are to improve on this nation’s currently horrific rates of domestic violence. This book is dedicated to the thirteen brave women and children who told the stories of their journeys from darkness to light, from abuse to freedom; and to all those who have yet to make that journey, for whom we hope this book provides both inspiration and guidance.